Based on Elastic Bare Metal (EBM) instances and high-speed interconnectivity of RDMA (Remote Direct Memory Access) technology, Super Computing Cluster (SCC) servers improve network performance and increase the acceleration ratio of large-scale clusters. SCC servers boast all the advantages of EBM instances and feature high-quality network performance with high bandwidth and low latency. SCC servers cater to high-performance computing for artificial intelligence, science/engineering computing, and audio/video processing. Supports high-speed RDMA network connection and GPU-direct to secure high bandwidth and low latency. Deploy independent CPU and GPU Elastic Bare Mental servers with ultra-high computing capabilities in each single node. Elastic Bare Mental servers capable of deploying in minutes and quick cluster resizing as needed. Highly secure isolation of physical servers to meet high availability and data security requirements. Create a supercomputing cluster with one click and no queueing. You can also automatically increase or decrease cluster nodes without the limit of a physical machine and enjoy flexible Pay-As-You-Go billing. Deploy powerful instances built on advanced hardware such as the Intel Skylake CPU, RoCE v2 RDMA network and Nvidia P100/V100 GPU. The superior acceleration achieved by high-speed networking maximizes the performance of multiple instance clusters. RDMA network enables high-speed communication of large-scale data such as GPUDirect, which significantly enhances multi-node cluster acceleration. Meet advanced computing power needs for big data + AI applications by combining the power of CPU and GPU in a single architecture. 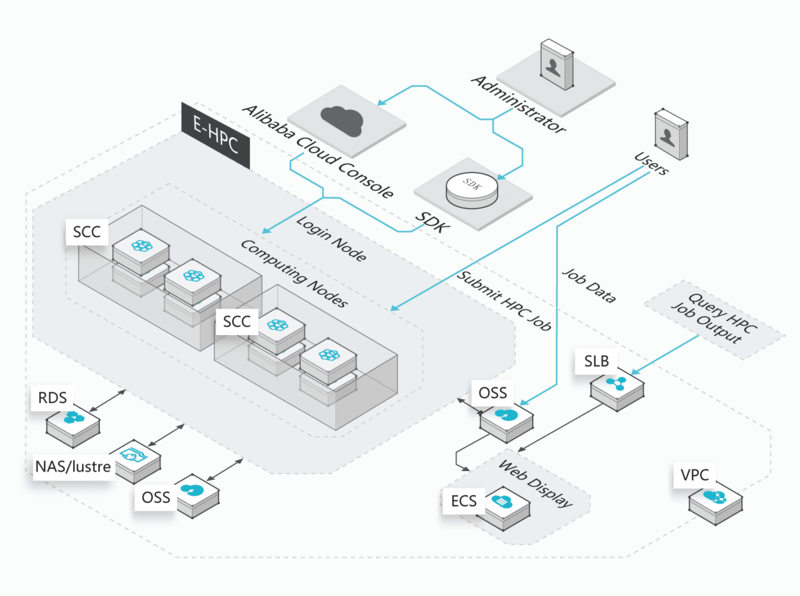 SCC seamlessly integrates with other Alibaba Cloud products and services to provide various solutions and serve different requirements.